Friendship Groups are the heart of our activities. Though our entire group is quite small, these quilting circles are intimate. They generally focus on an agreed-upon project, at times more than one. Meetings are held once a month and generally run three or more hours. Most groups' members take turns acting as host each month. Oftentimes, groups go on road trips to explore new fabric stores, meet for lunch or attend a workshop or demonstration. All groups are casual, with members' skills from beginner to novice. While some of the Friendship Groups listed here may be full, membership sometimes changes and new groups are always being formed. This group was started as a result of the Summer sewing classes held by Lynette Bjornstead. Members attending the classes were so excited about all we learned that we decided to continue and form a group. We held our first meeting in September. Our group now has 13 members! 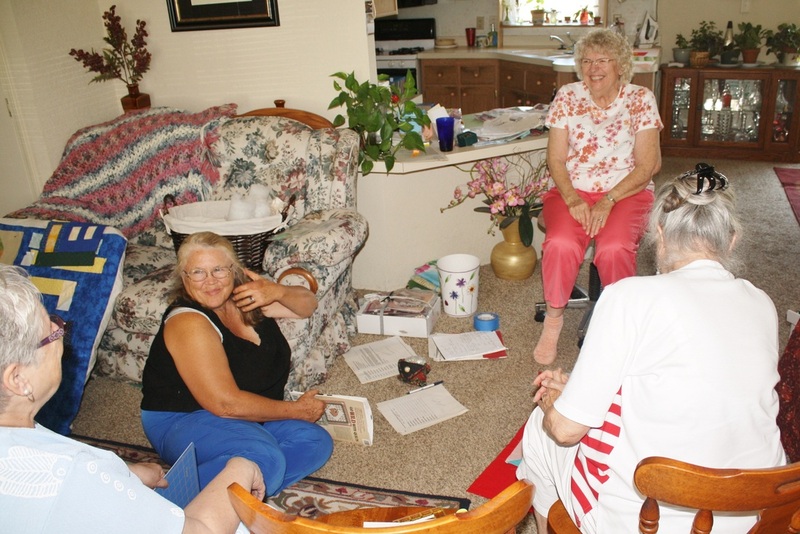 Chino Chicks is a small circle of quilting friends who take turns meeting at each other's homes on the fourth Monday of each month in addition, we meet to work on special projects. Currently, we are working on community projects and small multimedia projects. We are a group of twelve members who help each other with sewing problems and projects, and love to share our best deserts. Krazy Kwilters tries to involve sewing at each meeting and some of our members enjoy participating in round robin projects. As our first group project, we made and donated eight quilts for older adults in the Chino Valley and Prescott area. Read more . . . Since our Krazy Kwilters friendship group includes first-time quilters, we made these quilts using simple blocks. It is our goal to choose projects that will improve quilting and sewing skills. We also want to encourage our members to think outside of the box and have mentor members always willing to help others achieve their goals. We are often working on items to be displayed at our Quilt Show. Material Girls has been around since the beginning of the Chino Valley Quilters. project. One meeting a month is set aside to play Right, Left, Center with six inch fabric squares. Once a year we do our own shop hop excursion including lunch out. Over the past year we have completed a Christmas houses exchange and a Woven Stars table runner. We are currently working on a Thimbleberries Village block of the month project and have completed nine blocks. Some of the completed projects arer bed sized quilts and others are a large wall hanging/lap throw size. We have plans in the future to do some red work, two pieced projects, and some appliqué. 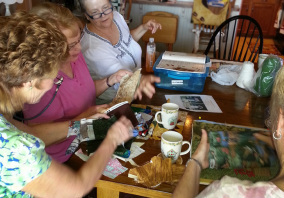 The Quilting Sisters group is a casual group with 13 regular members who meet the third Thursday of the month. We meet at each others' homes at 1:00. We all enjoy the various snacks the hostess has on hand. 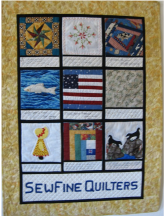 Sew Fine Quilters is one of two friendship groups formed by a founding member of Chino Valley Quilters. There have been many members of the group who have moved away and, luckily, new ones who have joined. In 2013, Sew Fine Quilters had fourteen members, about all a home can accommodate at one time. Once a year, we plan a group outing for shopping and breakfast or lunch. We also have a potluck holiday party. One of our favorite group activities is a pass-around project. We are hoping to plan more projects as time goes on. a.m.. At the beginning of the year, members schedule a month to be the host. Each host decides what we will do for lunch and which project or projects we will work on. We have many exciting projects lined up for this year and we are actively looking for projects to make for the 2018 Marketplace for the Quilt Show. We currently have ten members which is the maximum that most of our homes can host.